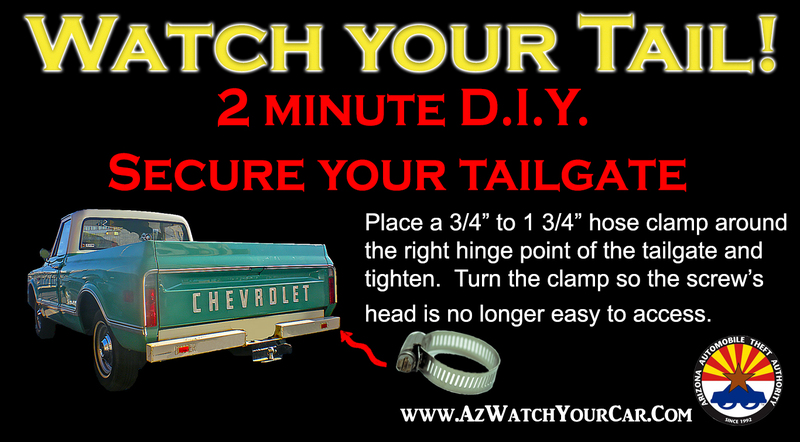 PHOENIX – This month, the Arizona Automobile Theft Authority (AATA) launches a new tailgate theft prevention campaign, “Watch Your Tail” in response to increasing tailgate thefts across the state. Arizona currently ranks fourth (4th) in the U.S. for tailgate thefts behind Texas, California and Florida; Phoenix also ranks 4th for Top 10 Loss Cities for tailgate thefts and reported a 15% increase in thefts last year. In Arizona, tailgates are being stolen from private vehicles and off dealership lots in most cities at rising rates. Unsecured tailgates can be stolen quickly and without the use of complicated tools. Replacement tailgates are in high demand and the increasing cost of replacing them has fueled black market demand. Stolen tailgates are listed on such sites as Ebay and Craigslist for resale as well as sold to scrap dealers. Additionally, a tailgate outfitted with a backup camera and other electronics can cost upward of $3,000 to replace. Always lock and secure tailgates. Utilize anti-theft tailgate locking devices, which lock the hinge mechanism manually or electronically. Park with the tailgate as close as possible to an object or structure to prevent the tailgate from opening and easily popping out. The AATA offers a Simple DIY Kit to Secure Tailgates – A metal hose clamp (diameters 3/4" to 1 3/4") can be installed around the right side of tailgate hinge, tighten with screwdriver. It takes two minutes to install and the tailgate is "locked" in place and cannot be easily removed with the clamp on (AATA staff are available for interactive demonstrations of this process – contact Ann Armstrong 602 364-2892). Arizona Automobile Theft Authority Launches New Statewide Tailgate Theft Prevention Campaign “Watch Your Tail.” PHOENIX – This month, the Arizona Automobile Theft Authority (AATA) launches a new tailgate theft prevention campaign, “Watch Your Tail” in response to increasing tailgate thefts across the state. Arizona currently ranks fourth (4th) in the U.S. for tailgate thefts behind Texas, California and Florida; Phoenix also ranks 4th for Top 10 Loss Cities for tailgate thefts and reported a 15% increase in thefts last year.